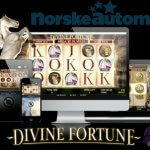 Play Divine Fortune Touch® for real! Not so many years ago yet, no jackpot games were available at the mobile casinos. It was NetEnt who changed this fact in 2013 with the launch of its first mobile jackpot game. If you have a bit of knowledge of the NetEnt Games, I don’t think it’s hard to guess what jackpot game I’m talking about. When writing this review, 35 millionaires were created by the game already. No wonder that the Mega Fortune™ Jackpot, the one I’m talking about, was the first NetEnt Jackpot to be available at the mobile casinos, of course, accompanied by the two smaller local jackpots. With 40% of NetEnt’s revenues coming from the mobile casino sector at the end of 2016, an increase of 83% compared to 2015, mobile casino games have proved to be as important as the desktop games. A development that asks for a change in priorities including more jackpot games suitable for mobile devices. 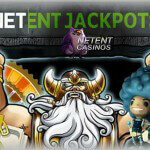 NetEnt always had a wide range of jackpot games including four pooled jackpots and a range of local jackpot games. Only two of them have been available as a NetEnt Touch® game but this was about to change in the beginning of 2017, the year Divine Fortune Touch® became mobile jackpot game number 3. The Divine Fortune™ video slot was developed to replace four former NetEnt Jackpot games as Bonus Keno and the three Wonders slots Icy Wonders™, Tiki Wonders™, and Geisha Wonders™. Popular for many years, by the time 2017 arrived these games were outdated and it would have been a waste of time to further invest in older jackpot games, the reason Divine Fortune™ was developed together with its Touch® version. When the four outdated jackpot games left the stage in December 2016, jackpots were put on hold just until Divine Fortune™ and Divine Fortune Touch® came into the spotlights as NetEnt’s first local jackpot game available at the mobile casinos. While the three Wonders slots were sharing two local jackpots and the disappearance of Bonus Keno meant the loss of another local jackpot, it’s not more than normal that the new local jackpot game consisted of three local jackpots. No sooner said than done, three local jackpots were added, also available while playing Divine Fortune Touch® at one of the many mobile casino platforms. The Mega Jackpot available in Divine Fortune Touch® definitely refers to the “fortune” while two smaller jackpots can be won as well. The three jackpots available in this mobile game are the only aspect left of the Wonders slots and even though it was the end of an era for those feeling involved in the NetEnt Games, technology moves on and so does NetEnt. Instead of penguins, geishas and coconuts, you now get a chance to get familiar with Pegasus, Medusa and more creatures and gods the Ancient Greek mythology brings along. 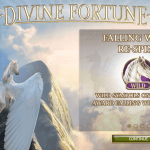 Divinity can be found all over the reels as Divine Fortune Touch® offers you a world of mythical creatures, golden coins, legendary riches and, most important, jackpots galore. The moment you open Divine Fortune Touch®, you’ll step into the world of ancient Greece to experience the legendary creatures and undiscovered riches from a forgotten world. Have a chance to become familiar with Ancient Greek gods this mobile slot was inspired such as Aphrodite, Apollo, Athena, Hera, Poseidon and Zeus, but the most divine Ancient Greek creature found in this Touch® game is Pegasus, one of the best-known creature in ancient Greek mythology. As divine as can be, you’ll find the winged white stallion in the spotlights in the role as Wild. Pegasus was supposedly the offspring of the sea god Poseidon and the Gorgon Medusa. According to the legend, Pegasus was born from the blood that spurted from Medusa’s neck when the hero Perseus killed her. Greco-Roman poets write about his ascent to heaven after his birth and his obeisance to Zeus, king of the gods, who instructed him to bring lightning and thunder from Olympus. As complicated as the algorithm used for the Random Number Generator involved in all NetEnt Games, I do understand the divine look of the white stallion once it expands on the reels. In all its all its glory, it’s definitely bringing light to the game and if lucky enough, fortune as well. 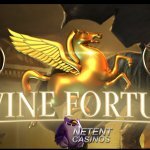 While Pegasus is of big importance in the main game and during Free Spins, Divine Fortune Touch® is offering a desirable Jackpot Bonus game as well, one to look out for in you chase for a local jackpot. It’s the combination of slot features, brilliant animations, gameplay, and music that intrigues me in this third jackpot mobile slot developed by NetEnt and in my opinion the chance to win a local jackpot is just an extra. I know it’s not as you’re most probably chasing a jackpot, but for the first time, I’m actually impressed by the looks and gameplay of a jackpot game. From all NetEnt Jackpot slots launched in the past years including the pooled jackpot games Mega Fortune™ (2009) and Mega Fortune Dreams™ (2014) and the local jackpot games Cosmic Fortune™ (2014) and Divine Fortune™ (2017), the latter is definitely my favourite. Cosmic Fortune™ already brings an attractive bonus game and animations but was never launched as a NetEnt Touch® game. With Divine Fortune Touch®, you can enjoy NetEnt’s third mobile jackpot game from any mobile device, at home, in the office or on the go. And with NetEnt being a pioneer in this sector, you don’t have to worry you’ll miss out on anything, you lose on speed or quality. All mobile slot games have been designed to work seamlessly on your mobile device. As long as you’re connected to the internet, you’ll be able to enjoy the great combination of slot features Divine Fortune Touch® consist of including Wild substitutions, Falling Wilds Re-Spins, a Wild on Wild feature, Free Spins, and a Jackpot Bonus game. Although the three local jackpots will attract many players, I don’t want you to underestimate the Wild features and Free Spins as well. The innovative Wild features are exceptional for a mobile slot, or jackpot game in general, and another reason to check out Divine Fortune Touch® at one of the mobile NetEnt Casinos. The Pegasus Wild and the epic music have been created to impress and a great addition to a great mobile jackpot game!